Regina Heinz returns to Decorex International this autumn to present "Flow", her striking collection of hand-painted and glazed architectural ceramics and wall installations. 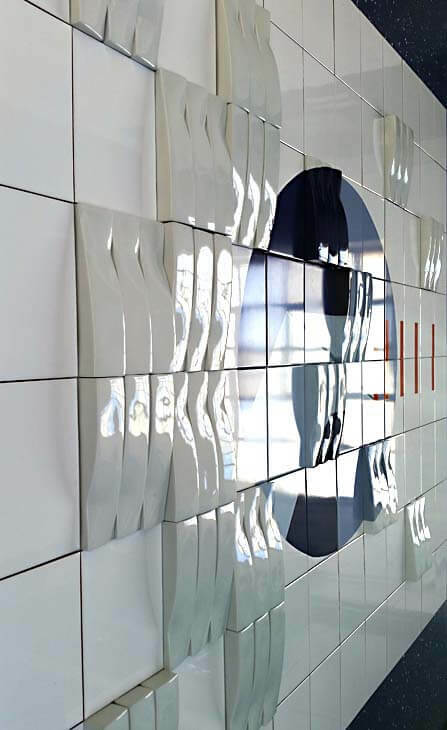 Flow is a unique concept of undulating tiles, designed to introduce texture and colour into architectural spaces. Poised between art and design, these beautifully crafted 3-dimensional "modules" can be combined and repeated in different ways to create stunning wall-sculptures for public spaces and domestic settings alike, adding an elegant and sophisticated element both to interior and exterior settings. The collection can be seen at Decorex from 17 to 20 September 2017, Syon House, London, stand K34, and on ceramart.net. As an artist, Regina Heinz is known internationally for her award-winning tactile sculptures and reliefs, with highly distinctive, abstract designs. Her tiles and wall sculptures – created for the world of interior design - are a distillation of her work as an artist. Scaled-up versions of her artworks, they have the same undulating surface, the same combination of fluidity and rigour. Inspired by reflections and the ever-changing movement of water, the installations evoke a calm, cohesive whole and, like tactile paintings, create tranquil reminiscences of the natural world within an urban environment. Since its inception in 2012 with the American tile retailer Ann Sacks, the collection has been continually expanded and now comprises hand-painted finishes, matte and high-gloss glazes, ceramic transfers, and luxurious gold and platinum surfaces. This year Regina will present a 2.3 m high installation, combining flat and 3D elements for the first time. Based on her recent travels to the Middle East the display takes inspiration from the contrast between topography and patterns taken from the natural world and the geometry of modern architecture to emphasize the sculptural and sensual element of her wall sculptures. Regina says, "I see the wall pieces as a continuation of the age-old tradition of tiles, friezes and reliefs used to articulate and adorn architecture – conceived in a new, contemporary idiom. Their 3-dimensionality enlivens and adds texture to the flat plane of the wall." The fusion of traditional and contemporary aesthetics results in timeless designs that lend themselves to both modern and more classical architecture. 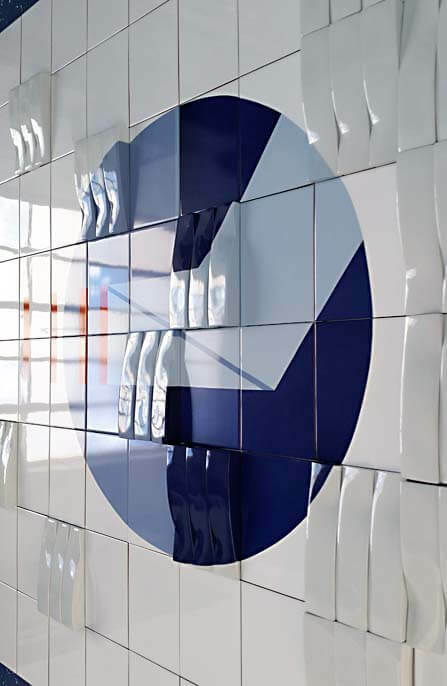 The tiles are hard-wearing and suitable for indoor and outdoor environments. In addition to her new limited edition designs, Regina offers a bespoke service – creating site-specific wall pieces and installations for individual settings.